The SOG Pentagon is an interesting little knife. What other knife solves the age old dilemma of carrying a plain edge or a serrated edge so effortlessly? Make no mistake, the Pentagon is a full out tactical knife. It’s relatively light weight and slim design make it a discrete carry or backup carry option. I think it’s a little too aggressive looking to be an every day carry knife, and since it is technically a dagger, it may very well be illegal to carry depending on where you live. Today I am looking at the full size Pentagon. 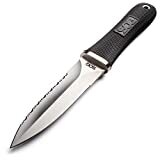 SOG offers a smaller version of the Pentagon (the SOG M-14K) that is equally cool and perhaps even more practical if you want to carry this knife every day or use it as a boot knife. The S14-N has a 5 inch blade, an overall length of 9.75″ and a weight of 5.8 ounces. For its size, this is a lightweight knife and it fills the tactical / emergency tactical role well. The steel of this knife is AUS 6, which is a little dated by today’s standards, but is still a decent steel (and is reflected in the knife’s very modest price tag). AUS 6 is in the same family as the very familiar AUS 8 stainless steel, and shares AUS8’s quality of being easy to sharpen while offering good corrosion resistance. Edge retention is this steel’s weakness so you will find yourself sharpening this knife more often. That said, the AUS 6 is serviceable, and it has 2 edges so if the plain edge gets dull, the serrations will continue to rip things up until you can find a whetstone. In terms of blade shape, this is a wicked dagger designed for stabbing and slashing and has a relatively thin blade with a weak tip – I wouldn’t use the knife to open any paint cans. I big feature is of course the Pentagon’s double edge. One side is plain edge and the other is mostly serrated, with a plain tip. The knife is shaving sharp from the box and I really like the options this knife provides. Serrations are great for cutting fibrous material and they don’t dull as easily. Plain edges are great for slashing and detail work. You really get the best of both worlds here, provided you live in an area that allows you to carry a double edged knife. This is a full tang knife with a Kraton handle. Kraton is a popular polymer used with a lot of fixed blade knives. It feels soft but it is very resistant to wear. The Kraton is nicely textured and provides outstanding grip wet or dry, with our without gloves. There is a lanyard hole near the pommel which you could use for added security. Since this isn’t a chopping knife, I typically leave the lanyard at home. This is an incredibly comfortable handle and I think SOG generally did a great job with it. One concern I do have with the handle however, is the total lack of finger guards. I would really like to see some sort of guard on this knife, especially since it is double edged. The handle is super grippy but it gives me peace of mind to have that guard. To combat that SOG doesn’t start the edge immediately where the handle ends. The first inch of blade is completely unsharpened and in fact has some jimping for grip. I would prefer that SOG included a finger guard and started the edge sooner, but perhaps that says more about me than the knife. SOG includes a nice molded kydex sheath with this knife. It holds the knife securely and provides 3 options for mounting. First we have a pocket/belt clip on the outside of the sheath. This is handy if you want to carry the knife in your boot or waistband (or pocket for that matter). SOG has also included a traditional belt loop and several eyelets for lashing the sheath to you or your gear. The sheath also has a drainage hole at the bottom so if you were to get water in the sheath, it isn’t going to sit there and rust out your blade. I also like how thin and light the sheath is, it makes for a very discrete carry. All in all, this is a good sheath that will appeal to a lot of people. The SOG Pentagon is truly a wicked blade. 2 edges make this knife incredibly versatile and potentially dangerous. It is an all out tactical knife designed as a backup for military personnel and law enforcement. However, there may be some minor issues with this knife depending on your point of view. The lack of a finger guard bothers me a little and some may like to see SOG use a steel that holds an edge longer. That said, there is a lot of value in this knife, and when you consider that this good sized doubled edged blade can be had for around $40 these issues become very forgivable. If you would like to buy a SOG Pentagon, I recommend purchasing it at Amazon.com or BladeHQ. Please consider that buying anything through any of the links on this website helps support BladeReviews.com, and keeps the site going. As always, any and all support is greatly appreciated. Thank you very much.